Let’s get the cliché out of the way – content is king. 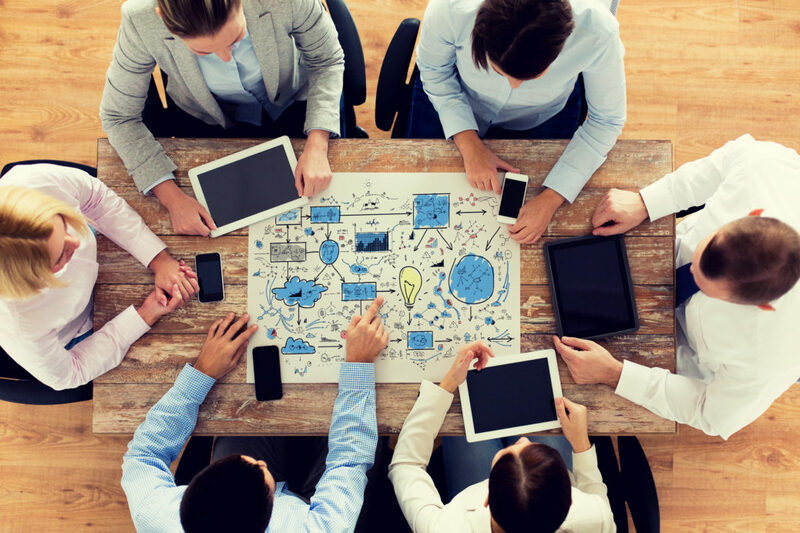 Content is evolving from content marketing where it’s simply creating valuable and enticing material, to a far more strategic, cross-team collaboration known as content operations. Even then, doing the latter isn’t enough. 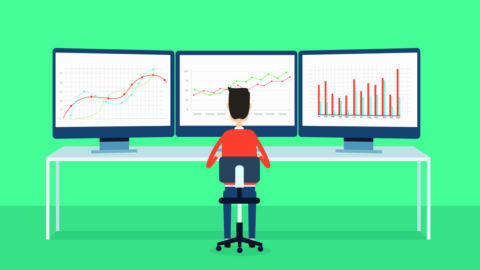 Excelling in content operations is key to driving business success. In a 2018 survey, 91% out of 870 B2B companies in North America said that their organization uses content marketing. Everyone knows you need quality content for customers to discover you through search engines or social media. Everyone repurposes content into marketing campaigns to serve personalized content, engage, and follow-up with prospects. The problem for those surveyed: only 36% said their projects move along efficiently while only 35% measure the ROI of their content marketing. This emphasizes why B2B marketers need to think about how to best plan, create, and measure content marketing efforts. Enter Content Operations; it’s one of the emerging trends I see in the martech space. After all, it’s the only strategy that ensures you get the most out of your content and your marketing budget. Innovative companies like Marriott, GE, and Bank of America are investing resources into making content perform better. So much that each created the visionary position of Chief Content Officer. It goes beyond what sales and marketing departments use to communicate with prospects in your workplace. In a larger corporation, you must assess each department’s content needs and then design “a machine” to produce that content. This means partners, human resources, and customer service departments. When you add these departments, the high-quality content creation task for marketing is immense. If you’re ready to improve your processes around generating high-quality content, you need to overcome some. 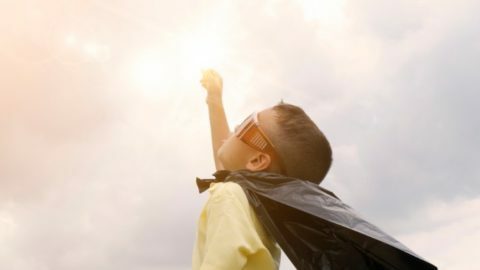 Moving beyond building personas – By now building personas is marketing (and marketing automation) 101, but many companies have yet to do this well. The real struggle starts as you bring your strategic plan to life and integrate it into day-to-day operations. Technology integrations – You need to integrate your social media, marketing automation, analytics platform, and search engine optimization (SEO) tools together. This integration allows better measure the impact of your content and how interactions at the top-of-funnel affect down-funnel conversions. Today’s B2B marketers use a multitude of content formats to drive the message forward that they need to distribute and measure. Many of my thoughts here result from speaking with Kristin Fallon, a Marketing Communications Executive at General Electric (GE). She leads the company in leveraging thousands of pieces of content using the Kapost platform. GE is a content marketing powerhouse and I suggest paying attention to how it undergoes the transformation. 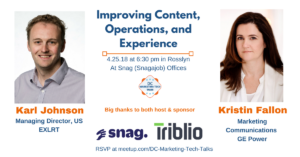 If you’re in the Washington D.C. area, we will have a discussion with Kristin about content operations, and Karl Johnson, the Managing Director at EXLRT about improving content using artificial intelligence (AI). 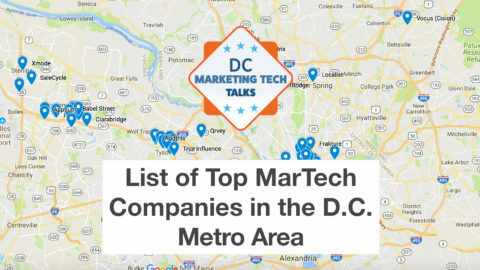 Please join us at Snag in Arlington, VA for the DC Marketing Tech Talks on April 25, 2018 at 6:30 pm. Thank you to Snag and Triblio for providing the space and snacks for this meetup. 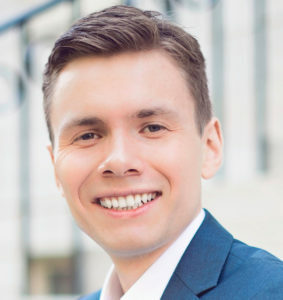 Maciej Godlewski, the CEO of Fired Up Digital, a digital marketing firm in Washington D.C. and Boston contributed this article. Maciej writes on technology trends facing the marketers of tomorrow.